CEO of Harbor Sweets Phyllis LeBlanc starts the conversation saying, “I started working with the company 39 years ago. There were five of us then and we were all candy-dippers.” Immediately, the statement brings to mind the hilarious “I Love Lucy” episode when the show’s namesake and her best friend Ethel wrap candy on a conveyor belt. 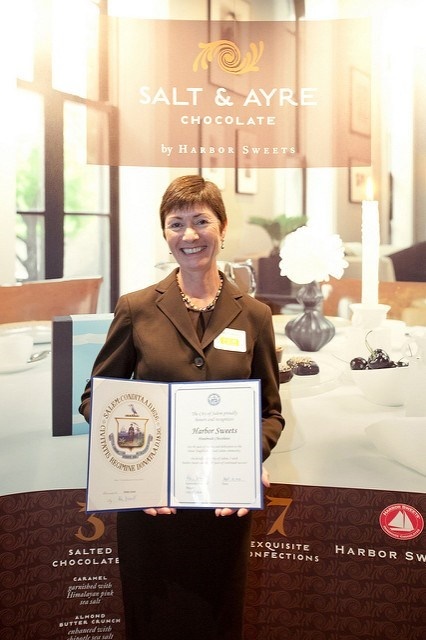 That moment became television history and a classic showcase much the way Harbor Sweets has aligned itself into the specialty chocolate world. Founded nearly 40 years ago under the ownership of Ben Strohecker, the candy factory has become world-renowned for making Sweet Sloops, toffee dipped sweets with pecans, resembling a sailboat. They’ve gone on to make a variety of unique confections, such as Salt & Ayre and Dark Horse, cementing the Salem, Massachusetts-made treats as iconic as Tiffany’s blue box or Chanel’s logo. Ranked as one of the top women-owned business in the United States, under the guidance of Ms. LeBlanc, the staff has grown to nearly 100 people and a thriving food business. 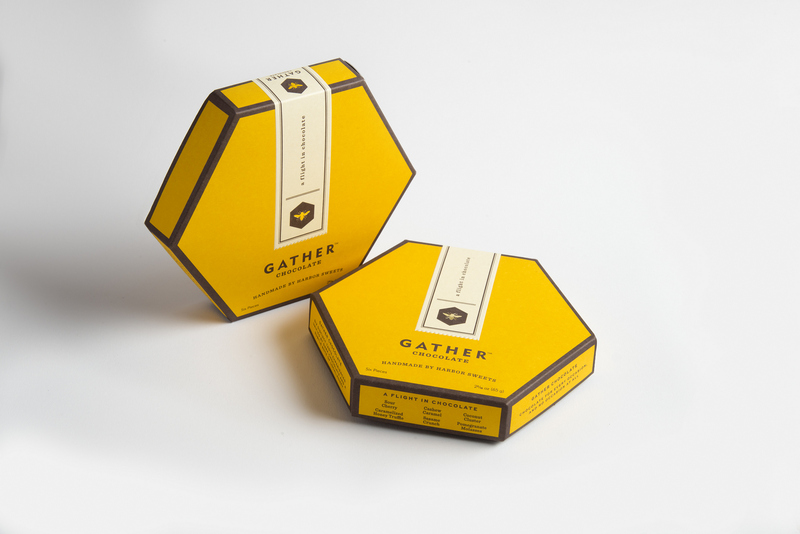 At this year’s Fancy Food Show held in New York, Harbor Sweets unveiled their newest line, Gather. Says Ms. 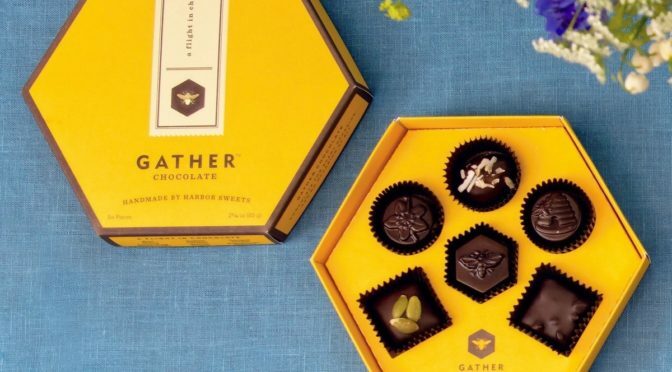 Le Blanc, “When I learned more about the plight of the honeybees and how important they are to our crops, our chocolates, and even our local economy, I started out on a mission to do what I could using Harbor Sweets…so we created Gather.” Gather is a flight of six unusual chocolates highlighted with the use of local wild honey. Partial sale proceeds will be given to the San Francisco-based non-profit Pollinator Partnership, whose work is carried out in North America via advocacy, education, and conservation of the bees and other pollinators. In the Harbor Sweets press release announcement, it quotes an alarming 2015 – 16 USDA Report stating that pesticides and parasites are seen as the foremost cause of a 44% drop in honeybee colonization in one year, making it the second highest annual loss reported in the past 10 years globally. Honeybee pollinators add more than $15 billion to America’s agricultural economy and are critical to the entire eco-system throughout the world. Ultimately, the true loss can’t be valued, since human beings thrive on our dependence of bees and pollinators like them such as bumblebees, hoverflies, butterflies, moths, and wasps. I don’t cook, my husband does! He is an excellent chef. Half & half for coffee, ice cream, and wine. What marked characteristic do you find unappealing in a person with whom you are sharing a meal? They are distracted by their cell phone. There are tools in the kitchen?!? A spoon for sampling ice cream. Julia Child – she took her food seriously, but not herself. Whom do you most admire in food? Somewhere between a cookie and a brownie, this chewy goodness is dotted with crunchy Sweet Sloops pieces and toasted pecans! 1. Place the flour, baking powder and salt in a small mixing bowl and stir to blend. 2. Place the chocolate and butter in the top of a double boiler set over simmering water and cook, stirring occasionally, until melted and smooth, 6 to 8 minutes. Remove from heat and let cool 15 minutes. 3. 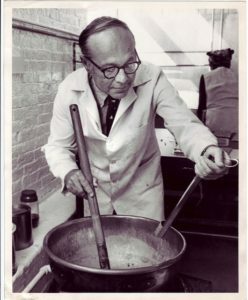 Place brown sugar and eggs in a large mixing bowl and, using an electric mixer, beat on medium high speed until thick and light in color, 3 to 4 minutes. Reduce the speed to medium-low and beat in the melted chocolate mixture and vanilla and almond extracts. Stir in the flour mixture, followed by Sweet Sloops topping and nuts. Cover and chill the batter for at least an hour an up to 24 hours to firm up. 4. Preheat oven to 350°F. Line 2 large rimmed baking pans with parchment paper. 5. Drop heaping 2 T mounds of batter on prepared sheets, spacing 2 inches apart. Bake until edges have browned but centers are slightly soft, 13-15 minutes. Let cool slightly and transfer cookies to a wire rack. Keep cookies in an airtight container, Will stay fresh 3-4 days.